What’s Your One Page Financial Plan? While I’m a firm believer that couples should have a financial game plan, I don’t think it has to be complicated or tediously detailed. Obsessing over the numbers can be counter-productive as we all have unexpected events happen which can throw our carefully laid plans off. It’s better to have a plan with enough flexibility to handle these curve balls so you can simply adjust as needed. 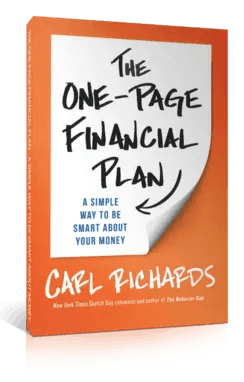 If that sounds like something you’d be interested in, then you should check out Carl Richards’ new book The One Page Financial Plan. It’s a great read to have around whenever the two of you need to brush up on your financial and personal goals. Most people visit financial planners like Carl because they want answers on what to do with their money. They want to know how much to save and invest, which debts to pay down first, or whether or not they can retire soon. The last thing they’d expect to hear from a planner is a question that Carl Richards asks his clients – Why is money so important to you? In The One Page Financial Plan points out that understanding why you want to build your finances is critical. A CFP that is truly interested in you would give advice tailored to your needs, goals, and resources. Imagine if you want to the doctor and she prescribed something before you’ve been examined and interviewed. You’d probably find another doctor and quick. The same should apply to coming up with a financial plan – you need to look at the current situation and come up with the destination before you map things out. As you’ve seen here on Couple Money, I think starting off with goals can be more productive. However, it can be difficult to talk about money if you haven’t had much experience (or if previous attempts were tense). So how can you two apply this with your own finances? Next time you have a money chat (go out and have some drinks!) bring a note pad and try it out. Talk about what money means to each of you. You may be surprised by what your spouse has to say. Don’t worry so much about the numbers, just see think and dream about where you want to be and how you’d like to get there. When you two have a general idea of what you’d like to do, go ahead and write those down in the notepad. Pick the right time to have the talk. Being in the right frame of mind is huge, so please avoid having this chat right after a stressful day. Make it fun. Get out of the house to chat. Don’t push it. If you two can’t get on the same page now, it’s okay. You can come back to it once you’ve had a chance to relax and think up some ideas. I’d love to hear from you. What’s your one-page financial plan? Previous Post: Store Brand vs Name Brand – Which is The Better Deal?